Аннотация: Предметом данной статьи является обобщение исследований и научных подходов к разработке и усовершенствованию метода сверхдолгосрочного прогноза трендовой составляющей урожайности сельскохозяйственных культур на примере риса. Экономическая эффективность прогнозов трендовой составляющей с заблаговременностью до 5-10 лет для планирования, развития и управления агробизнесом очевидна. Рассмотрены основные методы прогноза на основе гармонических шкал и методов "скользящего среднего". Проведена проверка метода по данным об урожайности риса в Приморском крае. Уточнены коэффициенты прогностических уравнений. Результаты оценки прогнозов показали удовлетворительный результат. Abstract: The subject of this article is to summarize the research and scientific approaches to the development and improvement of the method of super long trend component of the forecast crop yield on the example of rice. Economic efficiency forecasts the trend component with a lead time of up to 5-10 years for planning, development and management of agribusiness obvious. This article describes the method of forecasting the trend component of rice yield based on the harmonic scales and methods of "moving average". Tell verification method from the data on rice yields in the Primorsky Territory. Refined factors predictive equations. The results of evaluation of forecasts give a satisfactory result. Rice is a staple agricultural crop and it is the main food product for the majority of the world’s population . Rice prices are 2–2.5 times higher than wheat prices. In the Russian Federation (RF) the rice production is concentrated in the Southern Federal District (Krasnodar Krai, Rostov region), in the North Caucasian Federal District (The republic of Dagestan, Adygea, Kalmykia, Astrakhan region, the Chechen Republic) and in the Far East Federal District (Primorsky Krai) . The rice zone of RF is adjacent to the northern border of the world’s distribution range of rice. The least heat-supplied region in Russia is located in the monsoon climate of the Far East — Primorsky Krai. The weather conditions of this area are characterized by great imbalance that causes significant inter-annual fluctuations in yield . The gross harvest of rice in Primorsky Krai (PK) in 2013 amounted to 54.7 thousand tons . The rice production in the region allows almost fully to meet the needs of the population in PK and the Far East in this valuable agricultural crop. Analysis of the dynamics and temporal variability of rice yields in PK is shown in Figure 1. Figure 1. 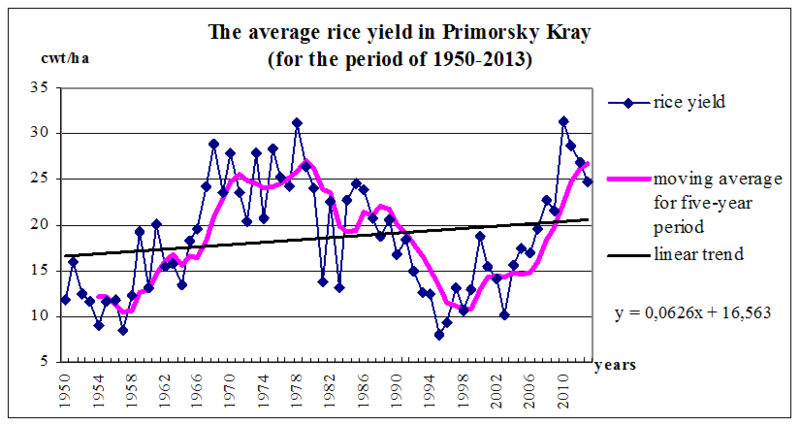 Dynamics of rice yields in Primorsky Krai [13 ]. distribution area, but also for forecasting a rice yield, the adverse weather conditions, risk assessments, recommendations for usage of climatic and prognostic information. Methods for climate influence estimation with the purpose of the production of agricultural crops, including rice are presented in works of foreign  and Russian researchers [4,5]. Agrometeorological conditions of rice fields in the Primorsky region were studied in detail and described in articles Chirkov Yu. I. , Pestereva N.M. [9, 10, 11, 12], Chernysheva L.S. [2, 3]. These authors proposed to consider the yield of rice in the form of two components. Currently there are about 100 different prediction methods and techniques. The most consistent assessment perspective crop yields (in this case rice), depending on the agro-climatic conditions expected following forecasting methods and techniques: methods of expert assessments, modeling; normative method; target forecasting; methods extrapolation . Extrapolation methods are based on the immutability factors determining the development of the studied object, and the object are in the spread of regularities in the past — on his future. In other words, the essence of the method of extrapolation is to examine existing in the past and the present and the future. There are the following target extrapolation methods: simple extrapolation; analytical time series alignment; exponential smoothing; methods of harmonic scales; use autoregression equations and methods of «moving average». Such a method was designed and is described in detail in the articles of the famous scientist agrometeorologist — professor Pestereva N.M. . It is very effective and at the same time simple enough in the performance of the method of averaging random variables (in our case — the temperature of the growing season rice), which gives an opportunity to assess the trend — the trend of further changes in those or other values. where t – means time, years (figure 1). where Pt-i — the actual value of rice yields in previous years (I = 1, 2, 3, 4.5). When calculating the weighting coefficients in (3) to focus on yields of recent years, which to some extent makes it possible to take into account changes in the level of agricultural technology. In PK, rice grows along the northern border of the global area of distribution. Weather and climatic conditions of the region characterized by high volatility and a high probability of extremely unfavorable and dangerous weather phenomena for rice: heat deficit, especially in the first half of the growing season (late May — early July). However, modern farming techniques, provided that farmers tailored climate information and forecasts with a big advance will allow manufacturers to significantly reduce the risks of rice production of this crop, as well as allow to develop a set of managerial decisions aimed at obtaining sustainable harvest rice in the monsoon climate of the Far East. According to a new federal program for the development of the Far East of Russia in the Primorsky Krai will be created modern agricultural cluster. It is hoped that the provision of agrometeorological in the coming years to regain its position and provide farmers a modern, high-tech and highly accurate prognostic information. This method is long-term forecast of crop yields has been adapted and successfully introduced at the forecast the other agricultural crops including aquaculture. 1. Anishchenko M.V., Slabko Yu.I. Optimization of conditions for obtaining high yields of rice in Primorsky Krai // Altai State Agricultural university, 2014. Vol. 5 (115), 24–27. 2. Chernysheva L. S., Pestereva N.M. About microclimatic heterogeneity rice arrays of Primorsky Krai // Proceedings of the Far Eastern Regional Hydrometeorological Research Institute, "Agrometeorology". – L.: Gidrometeoizdat, 1985. Vol. 121. С.115–121. 3. Chirkov Y.I., Chernysheva L.S., Pestereva N.M. Regionalization of rice-growing areas of Primorsky Krai on microclimate-forming factors // Meteorology and Hydrology, 1982. Vol. 11, 93–97. 4. Chirkov Y.I., Pestereva N.M. On the influence of different types of weather on crop yields in Primorsky Krai// Meteorology and Hydrology, 1983. Vol. 5.– pp. 103–108. 5. Chirkov Yu. I., Pestereva N.M. Using resources climate and weather rice growing, Leningrad, 1990. – 160 P.
6. Modern rice cultivation technologies, 2013. Laboratory № 1 GK "AgroPlus". Krasnodar. Retrieved from www.agroplus-group.ru /en/node/n 782. 7. Peng J., Huang J., Sheehy J.E. et al. Rice yields decline with higher night temperature from global warming/ / Proceedings of the National Academyof Sciences of the USA, 2002. Vol. 101(27). pp. 9971–9975. 8. Pestereva N.M. Long–term synoptic–statistical forecast of heat provision of the growing season // Proceedings FERHRI, 1988. #141. pp. 28–40. 9. Pestereva N. M. Using linear discriminant analysis in predicting crop yields // Meteorology and Hydrology, 1991. Vol. 6. pp. 101–108. 10. Pestereva N.M. Meteorol–economic modeling and the choice of optimal strategies in agriculture (for example, rice–growing sector of the Far East // Proceedings of the Far Eastern Regional Hydrometeorological Research Institute, Meteorology Asia-Pacific region: analysis and forecast. – St. Petersburg: Gidrometeoizdat, 1997. Vol. 2. pp. 90–102. 11. Pestereva N.M. Some features of rice production along the northern border of distribution // Australian Journal of Scientific Research, 2014. Vol. 1 (5), III. pp. 600–605. 12. Pestereva, N.M. Weather anomalies and the formation of rice yield in south of the Russian Far East// Advances in Environmental Biology, 2014. – T. 8, Vol. 17. pp. 88–93. 13. Pestereva N. M., Haiko L.A. Development of synoptic–statistical method of forecasting crop yields and mariculture in the south of Russian Far East //Proceedings “Fundamental and Applied Studies in the Atlantic Octans Countries”, The 1st International Academic Congress, 2014. pp. 12–17. 14. Primorskiy Krai. Socio–economic indicators: Statistical Yearbook/ Primorstat, Vladivostok, 2013. – 357 P.
15. Safonov G., Safonova Yu. Economic analysis of the impact of climate change on agriculture in Russia. National and regional aspects. Moscow, 2013. 44p.